The entire vino world was shocked when the news of Laurent Ponsot leaving his family Domaine, where he served for the past 36 years, circulated early last month. A single interview he had done was picked up by different wine-related online news platforms, and yet nothing has been heard from him since. 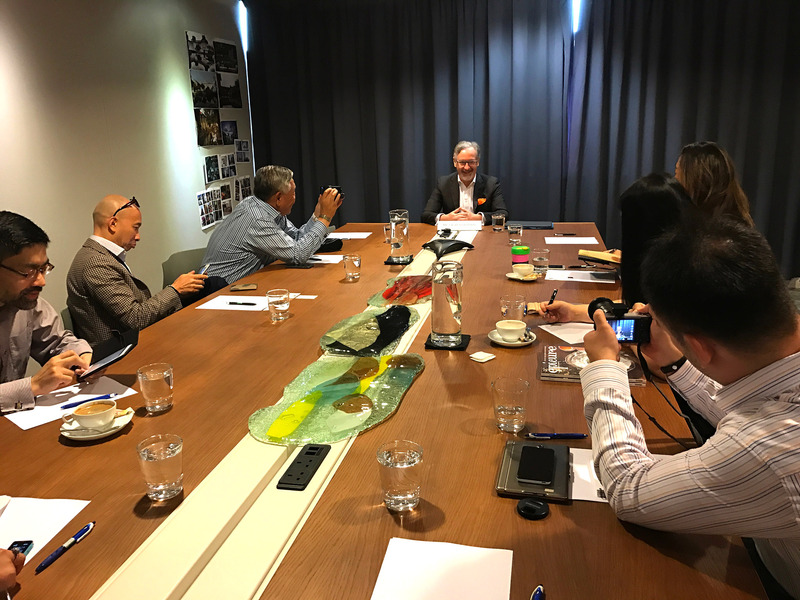 Just last week, Laurent Ponsot held his very first press conference to talk about 'What's Now and What's Next' of him in a place he considers his second home — Singapore. The aura of a fine gentleman walked into our office last Tuesday, all smiles on his face as I briefed him on the details of the press conference and interviews. Not a single trace of strain or tension was noticed, but instead, all that was heard was him saying "I must do it" in a very confident manner. It is inspiring hearing how passionate Laurent is about his wines and how he places his family domaine on a pedestal, where it is today. Leaving something to pursue another could be a bittersweet feeling; but for Laurent, he has been planning this move in his mind for 5 years without allowing it to materialise. This year, he has finally made the decision to embark on his visionary project and is very excited to start this venture with his son Clement, who was unable to work with him in the past for the reasons he doesn't want to disclose. For him, what matters is the present. "If you always look behind you, you cannot have a proper view of the future. You have to look in front of you knowing that the past is your base for you to become stable" he said calmly. When asked about what will happen to the domaine, he said that he does not have any idea, although he still owns 25% of the shares. He will act as a silent partner as his sister Rose-Marie took over his role over a month ago. Laurent says, "She'll probably hire a winemaker but I can't talk because I'm out now." Laurent is very optimistic about this move, but to him, nothing is certain as he is still constantly learning despite his decades of experience in wine making. "I cannot say that I'm the king of Burgundy. Every morning, I wake up with a lot of doubts, and this is important to go on, you have to improve. This is a challenge, this is very exciting to start again." he said excitedly. What else could be better to represent Laurent Ponsot's new brand but to name it after him. Though this new venture will be shared together with his 3 children, Clement will be the one helming the driver seat with him. The 37-year-old Mechanical Engineer by profession is also a famous drift racing driver and musician in Europe. Although these skills may not be attributed to wine making, but for Ponsot, what matters is that his son has a passion for wines. Laurent shared with us that being a winemaker is not difficult as long as the person has a lot of sense, to love wine, and to respect nature. In time to come, he will travel the world with Clement to tell his friends and distributors of his new winery. At the moment, everything is at the stage of extensive planning. Though he already owns some vines and the winery itself doesn't cost that much; the buying of vats, pumps, tractors, presser and other things can cost around 1million euros excluding the building construction and facilities. "The Banks still smiles at me" he joked after being asked how much is his capital with the new venture. Ponsot has received many offers to start outside of Burgundy and even foreign countries; but for him, his refusal to these offers is not a question of age but a matter of focusing on what he likes and what he knows. "It's already difficult to make a good job in one place. I don't want to run, for what? For glory? For money? I will focus on what I know. Burgundy is where I was born, in the village of Morey-Saint-Denis, so my roots are there" he said. "I have a blood in my wine more than the wine in my blood." he quipped. The new winery will be headquartered 5 kilometres away from Domaine Ponsot, which is in Gilly-Les-Citeaux, Vougeot - the main place well-known for Clos de Vougeot. Though he already has a building there, he will construct a much bigger facility which he expects to be completed by the 2020 harvest. Under this new name, he will produce 9 Whites and 7 Reds and he foresees this number to increase in the next few years. The first vintage of his portfolio is 2017 and this will be released by Fall of 2019. He could consider releasing a few of his 2016 vintage around September to October 2018. "It's a long-term project. We need to give time. I'm not the kind of guy who will decide on the harvest and bottling, but, no, nature has given me a lot of advice, I'll decide by then." In this contemporary technological milieu, Ponsot has never been left out, in fact, he's launching a new research on the alternative to a barrel. It is remembered that in 2008, he launched the "ideal cork" as a replacement to a conventional cork made of a polymer and expanded thermoplastic elastomer. His new research on the alternative barrel is an effort in finding a solution to the problems of barrels which are prone to bacteria and generating volatile acidity. The research could take 5-10 years but Ponsot is hoping that with the growth of technology, things will go faster. "I, myself am keen on technology. I am keen for a very long time. For example, I launched the first website of a winery on earth in 1989 and I did it myself, programming. Nine years before Google exist, I have my own website and a forum." he said with great pride. "This is to say that I'm really interested in the time we're living and try to find all the tools to help me follow my wish, which is me being passionate about wines." Ponsot enthusiastically announced that his winery will be futuristic in terms of design, architecture and facility. Finally, when asked if he has any words for Domaine Ponsot, he smiled and answered "Good luck to them and Good luck to me!"